Genuine Fargo lamination 82612. Laminating your organizations ID cards provides them with an extra layer of security and giving them more durability while keeping them more secure. The lamination is left off on the left side for a smart chip. 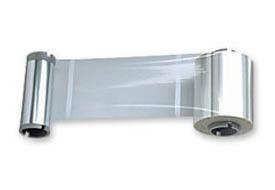 A Fargo printer with lamination capability is required in order to laminate your ID cards. Compatible with the following Fargo lamination printers: Fargo HDP5000 and the DTC4500 lamination modules only.